For a while now our family has had Keeshonds. A long while. We’ve had them fur balls for the past 22 years to be exact. I still remember when my dad brought Pako home some time in 1993 or 1994. When my family was given the opportunity to emigrate to United States my sister and I, 11 and 12 years old respectively, said we’re not going anywhere without Pako. So we took a winter dog to sunny SoCal. Pako was with us for 12 years. Then, exactly 10 years ago while on vacation in Poland, I found Oscar. Our Keeshond 2.0. He was pretty much a SoCal do, too, and only spent the last 2 or 3 years back in Poland with my parents. But he got sick and my parents had to let him go. The mood was dreadful for a couple of weeks. My mom and grandma’ wept every time Oscar’s name was mentioned, and my mom said “a home is not a home without a dog”. 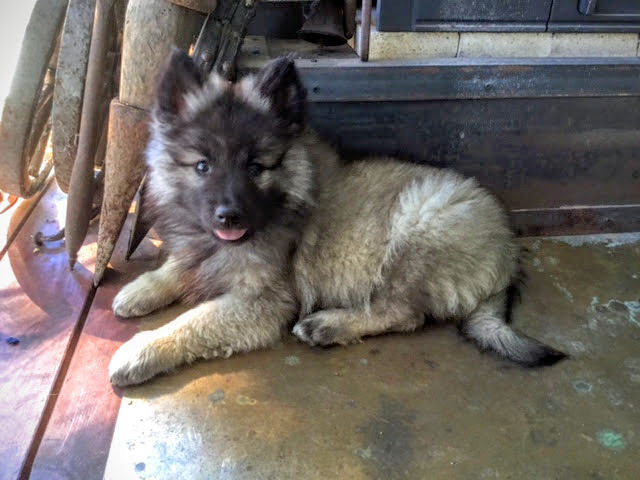 So without further ado, here’s Rookie, Keeshond 3.0. At 4 months old Rookie has a destruction force of a tornado and tears apart anything in his path, be that my parents garden or their living room. As cute and cuddly as he looks, he also has that face that says “I’m gonna mess things up in here”. hahaha. To us the most important thing was that he gets along with Fado, our chocolate lab. Oscar (2.0) wasn’t so kind and poked a hole in Fado’s ear. So we want to make sure Rookie plays nice from the get go. And naturally, they’re doing fine. Just have a look!